This section provides a tutorial example on how to draw Chinese characters on frame using the drawString() method with a Chinese font selected. Problem: I want to draw some Chinese characters in a frame. Solution: You can do in the same way as described in the solution of the previous question. In the paint() method, first change the font of the Graphics object to a Unicode font that supports Chinese characters. Then use drawString() utility method to draw the string with Chinese characters. 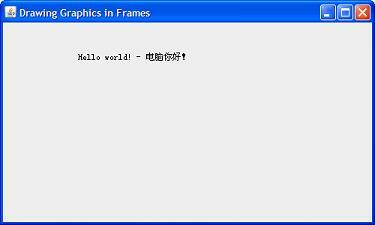 The following sample code, JFramePaintChinese.java, shows you how to do this. * Copyright (c) 2002 HerongYang.com, All Rights Reserved. Note: You need to have SimSun installed on your system. To verify this, search for C:\windows\fonts\simsun.ttc if you are using a Windows system.